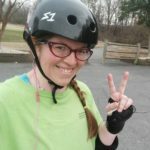 The Charlotte Roller Girls kicked off the New Year and said goodbye to the old on Friday, January 27 at Tremont Music Hall. Okay, so we were a little late in celebrating, but we’ve been busy gearing up for the start of a new season! 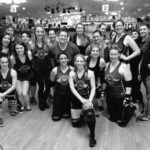 As part of our farewell to last year, we always take the time to recognize those skaters, refs, and NSOs who have really outdone themselves and made significant contributions to the league, as well as those who have just stood out in some special way, whether it’s because they’ve improved so much, taken the hardest hits, or just came to practice every day with a smile. And because we’ve got so many amazing people working hard to keep CLTRG awesome, we’ve got a lot of awards to hand out! But there’s one in particular that everyone looks forward to: the Fan Favorite Award. Maybe it’s no surprise to you (it was all of you who helped her win, after all! ), but there was a lot of anticipation in the room that night as the Fan Favorite Award was announced. And so it is with much excitement that we announce this year’s Fan Favorite . . . Rosie Cheeks! 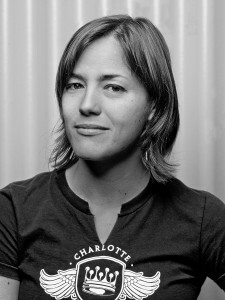 Rosie’s been skating with CLTRG since 2007. Not only is she an amazing athlete, she’s also one of the nicest ladies you could ever hope to meet and is well-known for always having an encouraging word for her fellow skaters, especially amongst the newbies. To celebrate this highly anticipated and much-coveted award, Rosie was presented with a beautiful, hand-made feather fan in the team colors painstakingly crafted by her teammates. After the presentations, there were smiles and cheers all around and we danced the night away. Thanks to all of our fans for voting for your favorite and continuing to support the Charlotte Roller Girls! 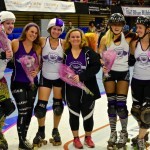 Look for Rosie Cheeks on the All-Star roster for the new season (which kicks off this weekend in Indiana against the Demolition City Derby Dolls), and be sure to come out and support all of your other favorite roller girls during 2012!